The fully transparent PVC material allows you to easily see what is packed in each travel packing cube. Keep everything organized and easily find what you are looking for without wasting time with this 3/1 pack of PVC Clear Makeup Bag. CLEAR, DURABLE, REUSABLE, STYLISH CLEAR TRAVEL MAKEUP BAGS- Fully transparent PVC material lets you easily see what you packed. Improved 0.3mm thickened Eco-Friendly transparent PVC material, softer and more pliable, durable and reusable.Thicker PVC and smooth zipper allows you to pack each bag to capacity without fear or ripping. SECURE & SAFE- Clear makeup organizers lets you easily spot what you packed. Easily get through security. Small cosmetic bag is TSA 3-1-1 carry on size friendly travel bags. Small makeup bag is great to use to get through security at concerts, music festivals, NFL games, any event where there is security check. STAY ORGANIZED- Multipurpose makeup bags are great storage & organizing solutions. Great to use as packing cubes for bathing suits, small clothing such as socks & underwear. Small makeup bag is also great as purse organizers. 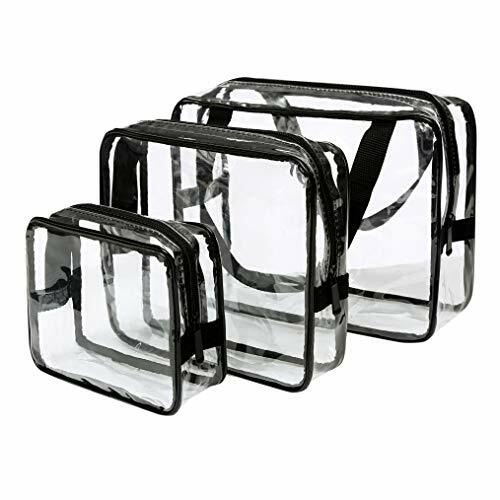 Use the clear makeup bags to store stationary, food, toys, & so much more.